New York (Tadias) – Here comes another anthropological discovery from Ethiopia: the oldest known fossil of human ancestor (3.6 million years old) has been found in the Afar region of Ethiopia – unseating the famous 3.2 million years old Lucy (Dinqnesh) — whose skeletal remains are currently touring the United States. The new bones, which are much bigger than Lucy, have been named “Kadanuumuu,” (kah-dah-nuu-muu) which means “big man” in the Afar language. 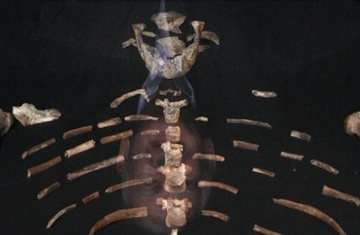 Ardi: Oldest Fossil of Human Ancestor? Congratulations to Dr. Yohannes Haile Selassie and his team on unearthing and reporting of an older Australopithecus afarensis male species skeletal remains in the Afar region of Ethiopia. Kadanuumuu or the ‘Big Man’ helps to further clarify our understanding of the evolution of the early human species. It is my hope that one day we will be able to establish a state-of the art paleontological museum in Ethiopia where curiousity seekers from all over the world come and learn about their early human ancestors. If confirmed this is big news for science. And yes, it will generate a great amount of tourism attraction. This is the first time I am hearing that “Lucy” is in the U.S. ARE YOU KIDDING ME? Is Ethiopia crazy or what? “Lucy,” “Selam,” and “Kadanuumuu” or the ‘Big Man’ need to be locked up in some bullet proof glass museum inside Ethiopia. Woy gooood. Do they know these fossils could be a cash-cow for the country if they are properly kept and displayed to the public inside Ethiopia? Yes, they’re crazy. they are supposed to keep these fossils in a very secured place to attract tourism in the future. I agree. We need to preserve and display these treasures in Ethiopia. It should be named “We are all Ethiopians Museum”.